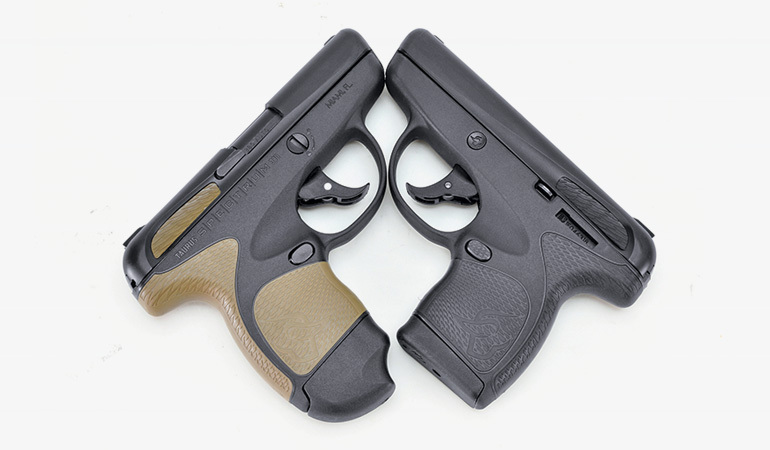 The new Spectrum from Taurus is a subcompact automatic I consider to be a mix of old school and new cool. As for old school, in the era of subcompact wonder-nines it is chambered in .380 ACP, the original subcompact workhorse cartridge. It features a double-action-only trigger system, and the sights for this subcompact piece are small and machined in one piece with the slide. New cool? 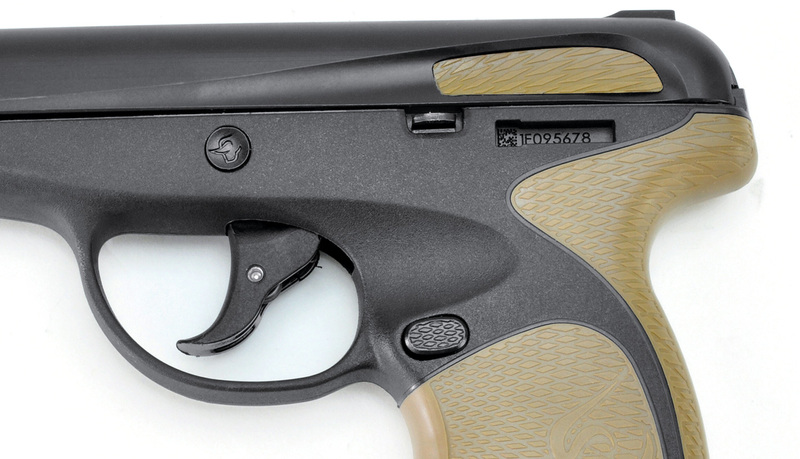 It is a striker-fired gun with a polymer frame, and this polymer frame features overmold inserts of “soft-touch proprietary polymers,” otherwise known as rubber. Plus, it is available in a whole spectrum of colors. Spectrum. See what they did there? Before we get distracted by the pretty colors, let’s look at the specs of the gun. The Spectrum sports a 2.8-inch barrel. Unlike a lot of .380s, the Spectrum is not a straight blowback gun. It features a tilting barrel that helps absorb some of the recoil forces. The pistol comes with two different magazines: one flush six-rounder and one seven-rounder with an ergonomic finger extension. I like the design of this extension. Not only does it fit the shape of your hand and allow you to get all your fingers on the gun, but also it is rounded, so it will not snag on anything during the draw. 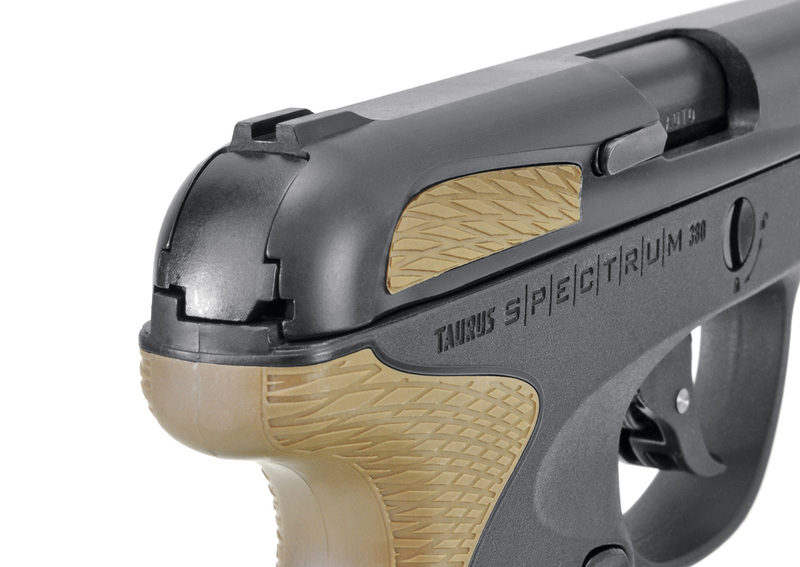 Taurus calls the Spectrum a “micropistol,” which I admit is a term I hadn’t heard before. While there are no specific criteria for what constitutes the more common term “subcompact” pistol, I would say the Spectrum should qualify. With the flush magazine in place, I can get only two fingers on the grip, but it is eminently concealable. Overall, the pistol is 5.4 inches long and 3.82 inches tall with the flush magazine inserted. The extended magazine adds about 5/8 inch to the height. As for width, it depends on where you measure the pistol because it has a lot of curves. Actually, except for where the frame and slide meet, the pistol is all curves. The slide at the front sight is barely three-quarters of an inch thick. The frame below the magazine release is just 0.8 inch thick. The top of the frame at the serial number is 0.95 inch thick. At the slide stop, the width bumps up to its maximum 0.98 inch. What do all those numbers mean? It means the Spectrum won’t be much fatter than your extended trigger finger—and not much longer. I have medium-size hands, and with my finger outside the trigger guard and lying along the frame, the tip of my index finger reaches the end of the Spectrum’s recoil spring guide rod. The Spectrum’s minimalist controls and contour ensure a no-snag draw. The slide lock lever is on the small side, too small to be used effectively to release the slide. 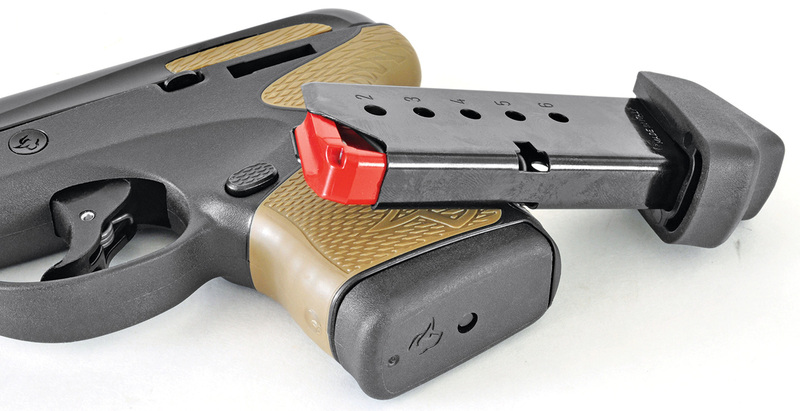 The slide does lock back on an empty magazine, but the little metal tab is called the slide stop and not the slide release for a reason. Reliably hitting the tiny protuberance to drop the slide after a reload is an iffy proposition at best. You’re better off just working the slide, which brings us to one of the “new cool” aspects of this gun. The slide doesn’t have serrations to help you grip it. Instead, there are teardrop-shaped, hollowed-out areas of the slide at the rear, and those dished-out areas are lined with rubber overmold for gripping. The end result looks cool, and different, and it works just as well as traditional serrations—if not better. The rubber overmold also covers all the gripping surfaces of the frame, and most of it features a vaguely diamond-checkered pattern. The overmold layer is thin and doesn’t have a lot of give, but because it is rubber instead of hard plastic, it keeps your hand in place while shooting. The overmold panels on the rear of the slide work as well as, maybe better than, slide serrations for control. The disassembly lock is located just below the ejection port. You’ll note a slotted pin on the right side of the frame above the trigger, with some lock/unlock icons. This is not some unneeded and unwanted internal locking device. Rather, it is the “lever” used to disassemble the pistol. Take the magazine out, make sure the gun is unloaded, turn the takedown pin using a key/coin/screwdriver in the indicated direction to Unlock, and the slide pulls right off the front of the gun. When you put the slide back on the gun and pull it all the way to the rear, the takedown pin resets to the lock position. The magazine release is steel and oval in shape. It features texturing to match the rubber overmold. It is also reversible. The owner’s manual doesn’t provide any instructions as to how to reverse the magazine release, but it is a simple procedure. The magazines have non-tilt followers, which Tarr thinks helped contribute to its reliability. The magazine release is reversible. A simple straight-wire spring holds the mag release in place and gives it tension, identical to what you’ll see in several other modern pistols. Use the tip of a punch up through the opening in the bottom of the frame to work the tip of the spring out of the detent in the mag release and the release will slide right out. The slide is rounded, smooth and free of markings. There was a little confusion regarding the slide of the Spectrum because it was changed after it went into production. Currently, all slides are made out of stainless steel, with the black ones sporting a black Melonite coating. A polymer frame and stainless slide is a good combination for a pocket/concealed gun that might get a bit sweaty. Let’s talk about those color combinations. You’ve got your choice of a black, gray or white frame. The slide is stainless steel, and you have your choice of a natural matte finish or black Melonite. As for the overmold, the rubber inserts, you have your choice of 20 different colors. Right now Taurus is offering eight standard color combinations of black, gray and white. It has three “house” combinations as well: white frame/stainless slide/cyan overmold, gray/black/mint and the black/flat dark earth version seen in these photos. “House color” combinations cost an extra $16. Other color combinations will be offered as special editions in the future, most likely through distributors. If you go to the pistol-specific webpage Taurus has created (TaurusSpectrum.com), you can see what the different color combinations look like by running your mouse cursor over the color palette. When she first saw the black/FDE Spectrum, my fiancée said, “Ooh, that’s cute. That looks like a great purse gun.” Some women find pink or purple guns insulting, but my better half really likes them, and whenever Taurus starts offering Spectrums with its Purple Haze, Rose Quartz or Indigo Blue overmold inserts, I know what I’m getting my girl for her birthday or Christmas. The unloaded weight of the pistol is just 10 ounces, but for a .380 of this size and weight, it is surprisingly controllable and pleasant to shoot. I ascribe this to two things. The rubber overmold does help a bit to absorb recoil forces, but the main reason this is such an enjoyable gun to shoot is the low bore. A low bore means muzzle rise and felt recoil are dramatically reduced. The pistol has a somewhat vertical grip angle. Even though I’m used to a much more aggressive grip angle, I found the Spectrum to point pretty darn instinctively. I think this instinctive aiming is helped by the Spectrum’s low bore and by the shape of its slide. You jab the gun out there and the roughly finger-shaped slide gives you a rough flash sight picture, and then your eyes are drawn to the sights for more precise aiming—when you can see the sights. Tiny sights that are the same color as the slide aren’t easy to spot if you’re in anything other than ideal lighting conditions. However, I realize guns of the type and size of the Spectrum are what you carry when you can’t carry a full-size gun with full-size features like prominent night sights, high magazine capacity and so forth. And guns the size of the Spectrum are intended for use at conversational distances. The Spectrum was first introduced in January 2017, and while it took a while to get it into full production, pistols are now shipping as I write this. Taurus in recent years has also had some inconsistent quality control, and so when it came time to test the Spectrum, I put some serious rounds through it. Before I ever got a test gun, I’d fired hundreds of rounds through Spectrums at three different media events. And I watched a lot of other media types do the same. I never experienced or witnessed a malfunction in what had to have been thousands of rounds fired. The first test gun Taurus sent me was an all-black model we eventually used on the new season of “Handguns & Defensive Weapons.” I’m not sure how many rounds we put through that gun during filming, but it was well over 100 over the course of three months, without cleaning. After the filming season was completed, I received a black/FDE Spectrum from Taurus for testing, and I put another 400-plus rounds through the two of them during testing, the majority through the original all-black gun. Honestly, that’s more rounds than most guns this size see in a lifetime. There was not a single malfunction with either gun. The trigger pull on the all-black Spectrum was slightly lighter and smoother than the black/FDE model, but I can’t tell you if it came from the factory that way or the pull smoothed out and lightened up with use. The trigger is polymer, with a smooth and slightly rounded face. Specs for the Spectrum call for a double-action trigger pull between seven and nine pounds. The measured pull of my all-black sample was 8.25 pounds, and the black/FDE model had a trigger pull that came in at 8.5 pounds, putting both within the published specifications. Trigger pull on both was somewhat smooth, with slight stacking near the end. That stacking actually allowed me to feel when the trigger was about to break, take a pause to make sure my sights were on, and then break the trigger almost like a single action. You’re not looking for brute force knockdown power if you’re shopping for a subcompact .380 ACP. Any gun is better than no gun. But that doesn’t mean your little pistol will be suitable only for hurting someone’s feelings. Massad Ayoob is a fellow gun writer, he is famous as an expert courtroom witness on firearms, and at the last seminar of his I attended, he went over a fatal shooting incident where a woman used a tiny .380 like the Spectrum to drop a big guy right where he stood. Ammunition manufacturers have been making huge improvements in defensive bullet performance across the board, which means the .380 ACP has benefited as well. Federal offers its high performance HST hollowpoint in .380, Hornady its venerable XTP JHP. Currently, my favorite .380 ACP load is the Honey Badger from Black Hills. Out of the Spectrum’s short little barrel, the Honey Badger load clocked in at a smoking 1,104 fps, with the same or less recoil than other loads tested and produces great penetration in short barrels. Small and light semiautos that you can conceal no matter what you’re wearing are niche guns, and with the Spectrum, Taurus has introduced a reliable and stylish subcompact .380 that gets the job done—and at an affordable price.